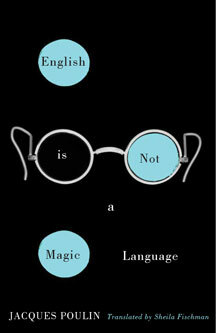 From award-winning translator Sheila Fischman comes a new novel by bestselling Quebec author and Canada Reads finalist Jacques Poulin, English Is Not a Magic Language. A follow-up to the author’s critically acclaimed 2006 novel, Translation Is a Love Affair (Archipelago Books), here we meet reader-for-hire Francis, the little brother of novelist Jack Waterman, whom longtime Poulin fans will remember from previous works as the author’s loose alter ego. One call and Francis will arrive at your door in his Mini Cooper, ready to read. He’s partial to works about the Natives, the fur trade, and the immense territory the French once held in North America. Altogether, Francis’s ordinary life in the shadows of his better-known brother could almost be described as happy. But what is he to make of a missed rendezvous with a mysterious woman? And why have the Mounties suddenly started following him in front of the Plains of Abraham, where New France fell to the British? Jacques Poulin, born in 1938 in Saint-Gédéon-de-Beauce, Quebec, is one of the leading novelists of his generation. Author of over a dozen novels, including Volkswagen Blues which introduced him to a wider American and Canadian audience, he has received many prizes. He lives in Québec City. Award-winning translator Sheila Fischman has translated over 150 Quebec novels from French to English, including Michel Tremblay, Marie-Claire Blais and Kim Thúy. She is a recipient of the Molson Prize for the Arts. She lives in Montreal.